RALEIGH, North Carolina (WTVD) -- I was excited to attend the statewide kickoff to Black History Month at the 17th Annual African-American Cultural Celebration on January 27! This free event, hosted by the North Carolina Museum of History was indeed a time of celebration. The celebrating began as soon as you walked up to the museum. With over 9,600 in attendance, the crowds of people were filing in to experience the event. 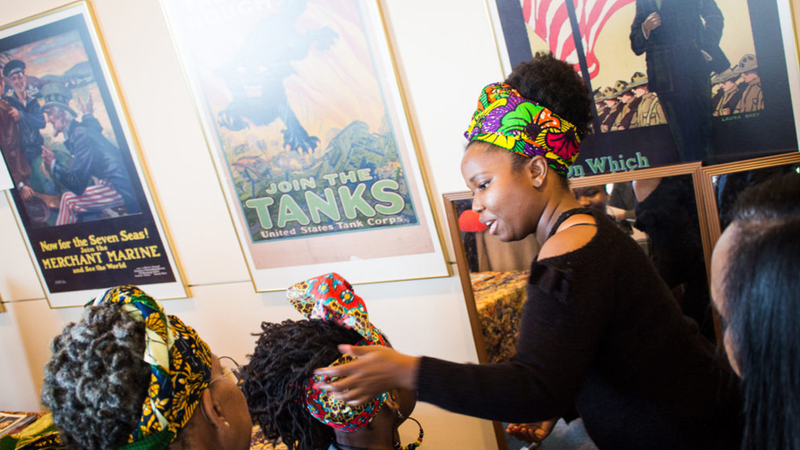 Every level of the museum hosted various aspects of African-American Culture. Such as music, history, sports, games, literature, food, art traditions, education, heritage, and everything in between! Since I am a lover of the Arts, shortly after we arrived, we headed for the Craft and Art Traditions, as well as the Activities and Information sections. There were many hands-on demonstrations and kid-friendly activities to participate in. Something that caught my attention very quickly was the beautiful art displays for Envision Saint Agnes Hospital of St. Augustine University's campus. The rich history and story behind it were one that really resonated with me. After speaking with Joyce Bailey Stephens, Career Development Coordinator for Wake County Public Schools, I just knew that I had to share. She directed me to Ms. Linda Dallas, Professor of Visual Arts at Saint Augustine for more information. So here's a little bit of Black History for you to kickoff Black History Month! Built in 1909, Saint Agnes Hospital was known as "The Healing Place". It served the African-American community for 65 years providing both nurses training and medical care. In 1922, it was referred to as the only well-equipped hospital for Negroes between Washington DC and New Orleans. How awesome is this and how much more should this history be told and preserved! Natasha is an ABC11 Community Influencer, read more articles by her here! From there, we navigated through some of the other tables. And because of the educational aspects of each table and presenter, it was an awesome event for our littles. We were all able to gather and gain more information about our culture. And to get their minds even more curious about upcoming Black History Month. The various tables included things from basket weaving and beadwork, to head wraps and even gold mining! Just before leaving, I got to meet the beautiful, Ms. Black North Carolina USA 2018, Stacey Sowell. Her platform is Fighting Type 2 Diabetes and you can find her on Instagram, Facebook, and blogging at #phdlife and #seedsoftherighteous! Mrs. Black North Carolina USA 2018 Chanda Branch, has a platform for the Justice Theater Project and you can find her on Instagram. Ms. Linda Dallas at (919) 516-4730 or lcdallas@st-aug.edu. Natasha is an ABC11 Community Influencer. Read more of her work on her blog .